In 2011, Directimage in Perth acquired an Acuity Advance HS 3565 flatbed, high-speed inkjet printer. The company also recently installed a 3.5m Uvistar. Now, in addition to being a major producer of posters, vinyls, point of sale products and directional signage, the company now offers a diverse range of signage services, including: billboards, adshels, real estate signage, floor graphics, vehicle wraps, shop front displays, bus and transit graphics, textiles and flag printing pullups and marquee decoration. With the help of the Acuity printer, Directimage is not only surviving the industry downturn, it is flourishing. And the same is true for GSP Print, the outdoor production division of APN News & Media. 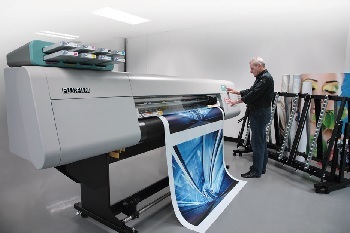 GSP decided to upgrade its printing abilities in 2012 with the purchase of an Inca Onset S20 digital flatbed printer and a Uvistar grand format UV printer. “These two new machines significantly expand both our capability and capacity”, Peter Piccione, general manager of GSP Print explains in the May 2012 issue of ProPrint. “They build our capability in the different outdoor segments, including roadside, street furniture and transit, and in the retail display segment of the point-of-sale market, which has been a very big growth area for us as well”. The new machinery positions GSP to capture and capitalise on high-quality, high-speed production in both POS and outdoor areas. It also strengthened the shop’s ability to go after shorter runs. “The screen press is suitable for longer runs, but with campaigns coming in with several creative executions and multiple formats, it allows us to expand our offerings,” Piccione says. To learn more about the possibilities wide format printing can offer your business, download the free guide, “How to Make Money with Wide Format Printing”, today.